It really goes without saying that not every game released in Japan makes it to the West. So far the Mega Drive has been lucky in that it has only seen a small handful of games that weren’t localized, a trait that will come to almost define the system’s library (most likely due to the incredible disparity in popularity of the system in America and Europe versus Japan. 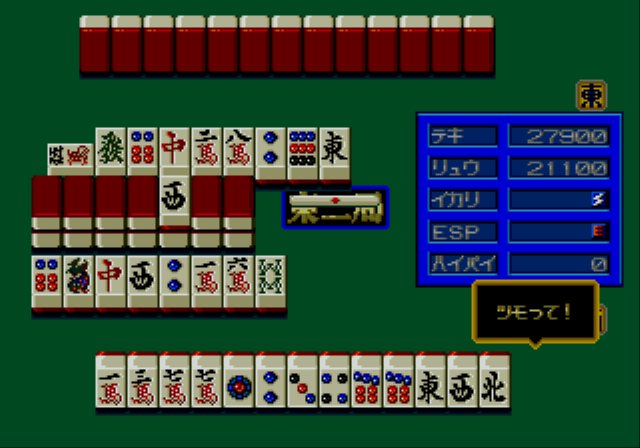 In Japan, the system was marketed early on as a real contender for arcade-style graphics and game play, but lost that market to a demographic already spoiled by the PC Engine and disillusioned by Sega’s slow start, something from which the system never really recovered) So far there have only been two games released in Japan that didn’t see an American release, and neither of them were a particularly huge loss for the Western world. Sure, a flashy war game and a surreal Technicolor platformer probably wouldn’t have hurt the American success of the Genesis, but they could have been ported over if someone wanted. Even Super Hydlide made it over during the opening salvo, and that has to be at least as inscrutable to an American gamer circa 1989 as any boss battle against a racist caricature of a Japanese man dressed as Cinderella. …I have no idea, honestly. 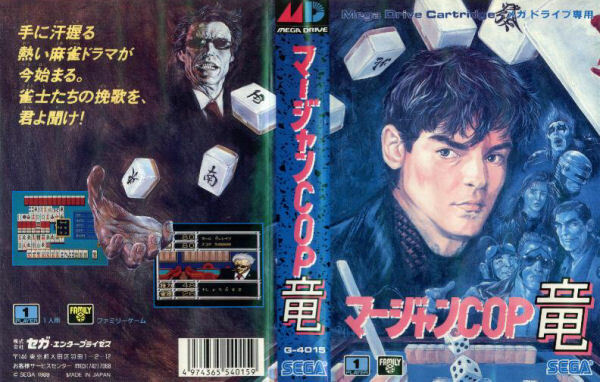 Even with a functional knowledge of how to play Mahjong (it’s ultimately not that different than Western trick-taking games like Hearts) I found myself completely unable to progress into the no-doubt seedy mahjong underworld of Mahjong Cop. 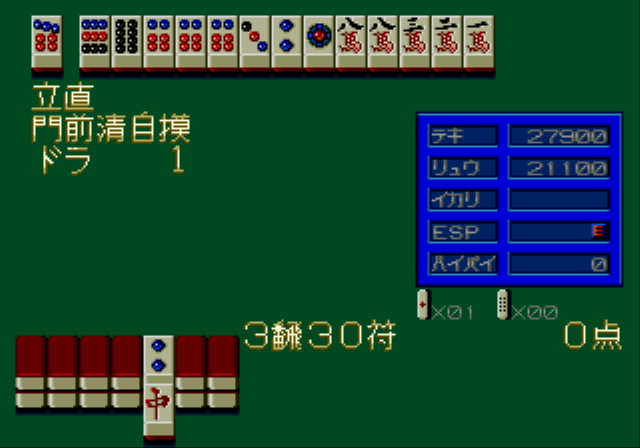 The game doesn’t seem to have puzzles between the Mahjong matches, but what it does feature is endless dialog trees, each rich with heavily condensed and colloquial Japanese text. It’s entirely possible to power through the first dialog with what looks like Anime Terminator and get to the part where he soundly trounces you in a game of Mahjong, but answering one prompt wrong sends you back to the beginning for more tedious, slow scrolling text (complete with every character receiving its own obnoxious typewriter sound effect like a high school student’s Power Point presentation). And I am sure if you understand Japanese, you are in for a treat if this guide is to be believed. 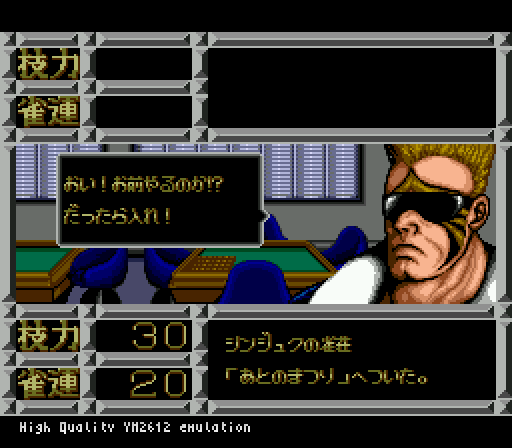 But unfortunately, Mahjong Cop is just a game that I am linguistically and culturally unequipped to play. 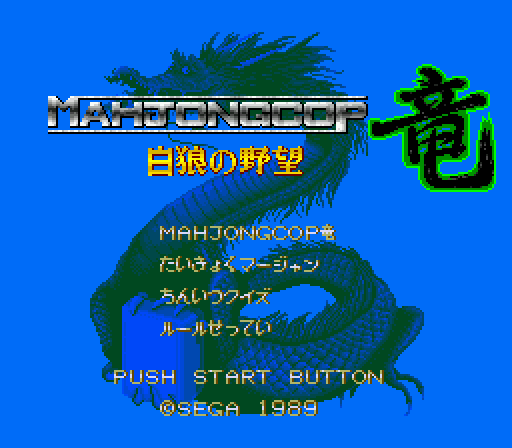 And considering the general lack of enthusiasm in translating the few lost “classics” (apparently Mahjong Cop is hardly beloved in Japan) for the Mega Drive amongst the emulation community, it will likely remain that way. Fortunately, I think we can manage. This entry was posted in Adventure, Board Game, Winter 1989 and tagged genesis, mahjong, mahjong cop, mega drive, video board games. Bookmark the permalink. Upon learning of the existence of Mahjong Cop Ryu, I immediately thought it a terrible missed opportunity that there was never a crossover with Battle Golfer Yui. LOL giving this a second read through and caught your comment on copyright infringement on the cover. So I looked back and realized that that is 100% a picture of Robocop on the front and a pretty good likeness of Dirty Harry on the back. I wish I could reconize the others.